No pictures for this post as the only poster I could find for either performance is about the size of a postage stamp. These two recordings are both from the same day but actually two different unrelated shows. The first was the La Société des Amis du Crime performance which took place in the Church Gallery Space at the Limerick School of Art & Design. The performance was part of the “Just Listening Showcase of Irish Based Sound Artists” event which was the culmination of a two week long exhibition. Fifteen different acts & artists performed on the final day but I only managed to make it in for the final perfomance which was that of La Société. Later that night the Sherpherds presented the “C:Inside Cooldown Party” which was the finale of a series of events based around the Raggle Taggle Studios in Limerick over the May Bank Holiday weekend. Boys Of Summer travelled to Limerick for the first time in an age to headline the show. Vomir may well be the most extreme gig ever to come to Cork, with a sound built of layer upon layer of analogue noise, his performances are full on, and wash over and into the listeners. Prepare to be immersed. Blue Sabbath Black Fiji are a guitar noise duo from Glasgow, and make a riotous noise that pushes rock to the far limits. Blasts of pop and beats fight with vocals and guitar, recalling the tougher end of Sonic Youth, or Wolf Eyes. La Societe des Amis du Crime got their sounds, metals and voices twisted. And now you can see where that got them. 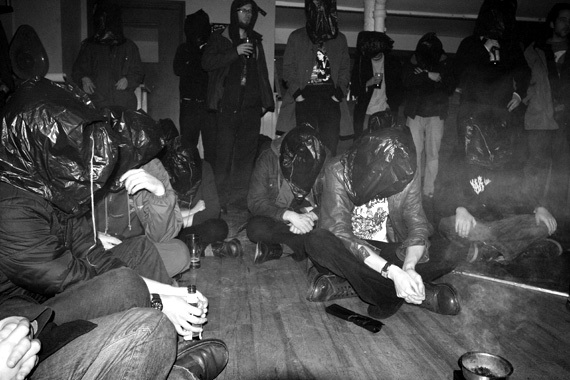 A night of harsh noise in the normally genteel venue of The Pavilion in Cork. 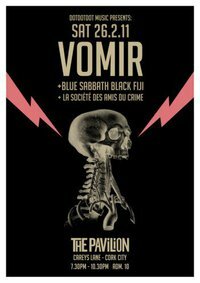 First time both Vomir & Blue Sabbath Black Fiji played Ireland so I had to make sure I was there for it. Sound on the night was pretty great, the venue was chosen mostly because of how good the PA is in there. Even still the Le Societie recording may be a little low so you may need to crank it up and the Vomir set was so loud that it caused the recording to clip a little.